So who is the BrumYODO collective? We’re a growing group of artists, undertakers, food artists, hospices, palliative care professionals and generally all-round interesting folk. We believe that there is such a thing as a good death – but it will only happen if we, the people demand it. We will only demand it if we understand what we need to demand, and we will only understand it if we talk about it. Our aim is to help the people of Birmingham have more open and honest conversations about Death and Dying. In 2015 a small group of us started talking about the challenges we faced in our own lives as our family and friends were getting older, but also about the challenges we saw people going through via the work we do on a daily basis. It was obvious to us that the official support structures were either not in place or sufficiently developed to help people at a level that was needed. Part of this issue is because on the whole we refuse to talk about the inevitable, believing instead that if we don’t talk about it, it won’t happen to us. But of course it will. And the challenge is that if we’re not prepared, if we haven’t planned in advance, if we haven’t talked to the people we love then we’re not going to be able to activate the kinds of choices we might wish. “You Only Die Once” from Sarah Chaundler, Jigsaw Pictures on Vimeo. After this we were invited to present at a number of conferences and NHS roadshows and have received a variety of nominations and awards for the work we have been doing. In 2017 we created a new Birmingham-based festival as part of Dying Matters Awareness Week called “A Matter of Life and Death” – everything you wanted to know about death and dying but were afraid to ask. The festival featured a diverse programme including panel talks and debates, films, creative workshops, performances, exhibitions, and other arts activities. Presented in association with mac Birmingham and in partnership with Birmingham Museum and Art Gallery, we were delighted to present events and activities in their venues as well as other places across the city. Supported by Arts Council England, A Matter of Life and Death saw hundreds of people of all ages and backgrounds joining the conversation. 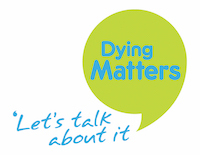 In addition to our own events, we are also keen to promote and support other people’s Dying Matters Awareness initiatives around the city through this website. So if you’re planning on running an activity please feel free to add it to the events calendar by “Adding your event”. And if you would like advice or support on running an event please feel free to get in touch through our “Contact Us” page.